Japan, 2001, 146 minutes, Colour. 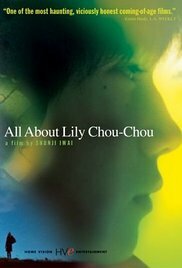 Lily Chou Chou is a fictional rock singer in this Japanese film about contemporary youth. The film is not about her. Rather, it focuses on a shy young boy, Hasumi, who is her greatest fan. He is a loner, absorbed in the internet world and his chat room. At school, he is bullied. When he meets a like-minded friend on the internet, he begins to come out of himself, only to find that his friend is a cruel arch-manipulator who destroys the lives of several of his classmates. The film moves like a dream, a mixture of realism and stylised fantasy reflecting Hasumi's perspective. While some sequences are lyrical, others portray teenage viciousness and violence in an alarming way. The film is almost two and a half hours long which gives the audience plenty of time to get to know the characters, try to understand them and to puzzle over what it is in contemporary society, in both east and west, that produces such bullying and victimisation.